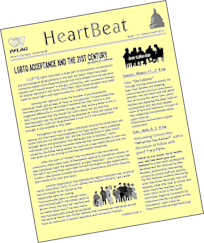 You can read “Heartbeat” ~ PFLAG-Olympia’s newsletter (pdf files) in the archives here. Subscribe to our newsletter “Heartbeat” as a print version mailed to your home – see form at the bottom of this page. OR subscribe to Heartbeat digitally and when a new issue is published you will get an email with a link to the PDF version you can download. See form below. AND you can also subscribe to the PFLAG-Olympia Alert List – a one-way announcement email list designed to inform our members and friends of upcoming events, programs, and more. Email updates are sent out prior to each meeting and whenever something comes up that we think that our list subscribers might want to know about. See form below.